For licensing for broadcasting rights, see broadcast license. This article includes information on TV licensing on the Isle of Man and the Channel Islands which is regulated by the United Kingdom's TV licensing authority. In the United Kingdom and the Crown dependencies, any household watching or recording live television transmissions as they are being broadcast (terrestrial, satellite, cable, or Internet) is required to hold a television licence. Businesses, hospitals, schools and a range of other organisations are also required to hold television licences to watch and record live TV broadcasts. A television licence is also required to receive video on demand programme services provided by the BBC (British Broadcasting Corporation), on the iPlayer catch-up service. Income from the licence is primarily used to fund the television, radio and online services of the BBC. The total income from licence fees was £3.83 billion in 2017–18 of which £655.3 million or 17.1% was provided by the government through concessions for those over the age of 75. Thus, the licence fee made up the bulk (75.7%) of the BBC's total income of £5.0627 billion in 2017–2018. The government's white paper of May 2016 announced that the licence fee will rise with inflation for the first five years of the Charter period, from 1 April 2017. The TV licence fee is collected by the BBC and primarily used to fund the radio, television and online services of the BBC itself. Licence fee collection is the responsibility of the BBC's Finance and Business division. Although the money is raised for its own use, the BBC does not directly use the collected fees. The money received is first paid into the government's Consolidated Fund. It is subsequently included in the 'vote' for the Department of Culture, Media and Sport in that year's Appropriation Act, and passed back to the BBC for the running of the BBC's own services (free from commercial advertisements). The money also finances programming for S4C and the BBC World Service as well as to run BBC Monitoring at Caversham. In 1991, the BBC assumed the role of TV Licensing Authority with responsibility for the collection and enforcement of the licence fee. The BBC is authorised by the Communications Act 2003 to collect and enforce the TV licence fee. Section 363 of the Act makes it against the law to install or use a television receiver to watch or record any television programmes as they are being broadcast without a TV Licence. Section 365 of the same Act requires the payment of the TV licence fee to the BBC. The licence fee is formally set by the Secretary of State for Culture, Media and Sport by the use of statutory instruments. The relevant statutory instruments are the Communications (Television Licensing) Regulations 2004 and amendments since that time such as the Communications (Television Licensing) (Amendment) Regulations 2010. As well as prescribing the fees, the regulations also define "television receiver" for the purposes of the law. For people living in the Channel Islands and Isle of Man, TV licensing law is extended to their areas by Orders in Council made by agreement with their own governments. As part of its enforcement regime, the BBC is authorised to carry out surveillance using powers defined by the Regulation of Investigatory Powers Act 2000 and the Regulation of Investigatory Powers (British Broadcasting Corporation) Order 2001. The BBC is permitted by the latter order to use surveillance equipment to detect unlicensed use of television receivers. As the public body responsible for issuing TV licences, licensing information held by the BBC and on the BBC's behalf by TV licensing contractors is subject to the Freedom of Information Act 2000. The BBC withholds some information on licence enforcement using exemptions under the Act; in particular, under section 31, which permits the withholding of information on crime prevention grounds and under section 43(2), which allows the BBC to retain information judged commercially sensitive. In January 2006, the Office for National Statistics (ONS) changed the classification of the licence fee from a service charge to a tax. Explaining the change the ONS said: "in line with the definition of a tax, the licence fee is a compulsory payment which is not paid solely for access to BBC services. A licence is required to receive ITV, Channel 4, Channel 5, satellite, or cable". A briefing paper from the House of Commons Library described the licence fee as a hypothecated tax (i.e. one raised for a particular defined purpose). The TV Licence Management Team, which is part of the Finance and Business division of the BBC, oversees the TV Licensing system. The TV Licence Management Team is based in the BBC buildings at White City Place in London. The majority of TV licensing administration and enforcement activities are carried out under contract by private companies. The TV Licence Management Team oversees the performance of the contractors. The BBC pursues its licence fee collection and enforcement under the trading name TV Licensing, but contracts much of the task to commercial organisations. TV Licensing is a trademark of the BBC used under licence by companies contracted by the BBC that administer the television licensing system. Concerning the relationship of the BBC brand with the TV Licensing brand, the BBC's position is: "The TV Licensing brand is separate from the BBC brand. No link between the two brands should be made in customer facing communications, in particular, use of the BBC name and logo". However, it also states that the rules for internal communications and communications with suppliers are different and: "the name BBC TV Licensing may also be used within department names or job titles for BBC employees". A major contractor is Capita which specialises in outsourcing for government projects. Capita is responsible for the administration and enforcement of the TV licence fee. It is expected that Capita will earn £1.10bn – £1.55bn from its contract with the BBC if it runs its maximum 15 years from July 2012. Capita's TV Licensing Headquarters is based at India Mill, Darwen, Lancashire. The services carried out by Capita on behalf of the BBC include dealing with TV licence queries, processing TV licence applications and payments and the maintenance of the licence database. Enforcement tasks include visiting addresses, identifying people watching TV without a licence, taking statements, and achieving prosecutions of TV licence evaders. TV Licensing debt collection is carried out by Akinika, which is a debt collection agency owned by Capita. Capita's TV Licensing headquarters is at India Mill, in Darwen, Lancashire. Capita employs a number of subcontractors for part of its TV Licensing operations – one important one being Computer Sciences Corporation which provides and modernises the required IT infrastructure. Since 2004, Capita has undertaken a proportion of TV licensing administration at locations outside of the UK and "has progressively increased the amount of work processed overseas each year". However, as of 2013, Capita has not set up any overseas call centres to carry out TV Licensing work and it would need the BBC's permission to do so in the future. Some of Capita's TV Licensing work is carried out in Mumbai, India. Marketing and printing services, including reminder letters and licence distribution, are carried out by Proximity London Ltd.
Media services are contracted to Havas Media. Other contractors involved in TV Licensing include PayPoint which provides over-the-counter services in the UK, and the post offices which provide the same services in the Isle of Man and Channel Islands. Also involved are: AMV BBDO Ltd who provide advertising services, and Fishburn Communications Limited who carry out public relations. A TV licence, once issued, is normally valid for a maximum of 12 months. The period of its validity depends on the exact day of the month it is purchased; this is because TV licences always expire at the end of a calendar month. If a licence were to be obtained in September 2014, for example, it would expire on 31 August 2015. Thus the period of validity would vary between 11 and 12 months depending how early in the month it was bought. If an existing licence is renewed on time, the new licence will last the full 12 months. The BBC sometimes issues 'short dated' licences in situations when a licence is renewed after the expiry date of the previous licence. The BBC does this as it assumes that TV was being watched in the interim period between expiry and renewal. Short dated licences are set to expire 12 months after the previous expiry date. If a UK resident aged 74 years wishes to purchase a TV Licence, they can apply for a short-term TV Licence to cover the time until they reach 75 when they become eligible for a free licence in the UK. Short-term licences for 74-year-olds are also available on the Isle of Man and Guernsey. If a TV licence is no longer needed for an address it is possible to cancel a licence and apply for a partial refund. The amount refunded will depend on the time left to the expiry date. Normally only full quarters (that is three consecutive calendar months) of unexpired licence period are refunded. The BBC may also revoke a licence under certain circumstances. The level of the fee is decided following periodic negotiations between the UK Government and the BBC Trust. From 1988 to 2010, the licence fee was increased annually each April Before 1988, increases in the licence fee happened at irregular intervals, sometimes a few years passing between changes. Between April 2010 and April 2017 the licence fee remained constant at £145.50 per year. In 2018 a TV licence costs £150.50 for a colour and £50.50 for a black and white TV Licence. Direct debit. Payments may be made annually, quarterly or monthly. Debit or credit card. Annual payment. TV Licensing payment card. Holders of this card will have a payment plan showing when and how much they need to pay. Payments may be made weekly or monthly at PayPoint outlets. Payments may also be made online, by phone or by text message (with credit or debit card). TV Licensing savings card. This is a way for a licence fee holder to save for a subsequent licence. If enough money for the new licence is saved up, a new licence is sent automatically. Otherwise the balance has to be paid for. Cheque and postal orders. Annual payments may be made by post by these methods. BACS electronic transfer. Annual payments for renewal licences only. A Post Office in Guernsey. Unlike in the UK, TV Licences may still be purchased at Post Offices on Guernsey, Jersey and the Isle of Man. The payment methods mean that the licence fee is paid for either completely or partially in advance. Annual payments require complete payment in advance. For monthly direct debit, a new licence is paid off in 6 monthly installments of just over £24 a month. Renewal licences are paid for in 12 monthly installments starting 6 months before expiry of the licence in force i.e. starting 6 months before the renewal date. Quarterly payments made using direct debit carry an additional cost of £5.00 per year, or £1.25 a quarter, which is included in the licence fee total. This addition is described as "a small charge" in the generic letter issued by TV Licensing to those paying by direct debit, and on the TV Licensing website it is justified with: "By paying quarterly the majority of your licence is paid for as you use it. This differs from our other instalment schemes, where at least half of the licence fee is collected in advance. As a result, quarterly payments incur a small premium of £1.25 per quarter which is included in your payment." Typically, direct debit schemes in the UK for major utilities or publicly provided services operate in a reverse way, granting a discount to direct debit payers. 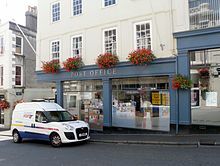 In the Channel Islands and the Isle of Man, over the counter services are provided by the Post Office rather than by PayPoint outlets. In the United Kingdom, free TV licences are available to those aged over 75. The concession covers the whole household, so that even if just one member of the household is over 75, then a free TV licence may be applied for to cover all the residents. From 2016 the BBC began to pay part of the cost of this subsidy, which had previously been covered by the UK government. By 2020 the BBC must pay all the cost of the scheme, estimated at £745m of its 2020/21 budget. In November 2018 the BBC launched a consultation on whether the concession to the over-75s should continue from 2020 and, if so, in what form. The Isle of Man has an identical scheme funded by the Isle of Man Department of Social Care. There are schemes for elderly residents of the Channel Islands, but they vary in detail and eligibility. Residents of the islands of Guernsey, Alderney and Herm (parts of the Bailiwick of Guernsey) who are over 75 can apply for a free TV licence to cover their household. In addition, over-65s in receipt of state benefits may be eligible for the concession. However, no over-75 concessions are available for residents of Sark, which is part of the Bailiwick of Guernsey. On the island of Jersey, the concessionary licences are available on a means-tested basis. Licences are half price for the legally blind. In order to qualify for the concession, a blind or severely sight-impaired person must apply to the TV Licensing Blind Concession Group with proof of impairment, either a copy of the document of blind registration or a certificate from an ophthalmologist. The concessionary TV licence covers TV use by the whole household. Those aged over 60 and in residential care homes (including nursing homes, public-sector sheltered housing and almshouses) qualify for Accommodation for Residential Care (ARC) licences for £7.50 a year. TV licence sales figures were quoted by the BBC to be 25.562 million in the year 2014/15, including 4.502 million concessionary licences for the over 75s, which were paid for by the UK government. The equivalent figures for the year 2013/14 were 25.478 million total licences including 4.328 million licences for the over 75s. In 2014/15, the BBC estimated that there were 26.916 million licensable properties in the UK (defined as premises where live TV was being watched), indicating that if the BBC estimates are correct, around 95% of properties are correctly licensed. The total income generated from licence fees was £3.8302 billion in 2017–18. The vast majority of TV licences are for colour TV. For example, there were 10,461 black and white TV licences in force on 31 August 2014, compared to 25,460,801 colour TV licences. The BBC has also stated that during the financial year 2013-14, a total of 41,483 blind concessionary (half-price) licences were issued in the UK of which 29 were blind concessionary black and white licences. In January 2012, there were 36,261 colour licences in force in Jersey as compared to 77,480 addresses (residential properties, businesses and other premises) on the TV Licensing database for the island (at the end of December 2011). This would suggest around 53% of Jersey addresses did not have a TV licence at the beginning of 2012. The comparable figures for Guernsey are 23,673 licences in force in January 2012 and 40,263 addresses on the database at the end of December 2011. Thus there were around 41% unlicensed properties in Guernsey at the beginning of 2012. When television broadcasts in the UK were resumed after a break due to the Second World War, it was decided to introduce a television licence fee in order to fund the service. When first introduced on 1 June 1946, the licence covering the monochrome-only single-channel BBC television service cost £2 (equivalent to £81.49 as of 2018). The licence was originally issued by the General Post Office (GPO), which was then the regulator of public communications within the UK. The GPO also issued licences for home radio receivers powered by mains electricity and was mandated by laws beginning with the Wireless Telegraphy Act 1904, to administer the licensing system; however, the TV licence also covered radio reception. The BBC started regular colour TV broadcasts in the summer of 1967. On 1 January 1968, a "colour supplement" of £5 was added to the existing £5 monochrome licence fee; the £10 colour fee was the equivalent of £170.35 in 2018. The licence fee increases with inflation; on 1 April 2019 it rose to £154.50 for colour TV and £52 for monochrome TV. The radio-only licence was abolished on 1 February 1971, when it was £1-5s-0d (£1.25 in decimal UK currency) or the equivalent of £21.29 at 2018 prices. On 1 April 1991, the BBC took over the administration of television licensing in the UK, assuming the responsibility of licence fee collection and enforcement. Since this date, the BBC has been the statutory authority for issuing television licences (before April 1991, the statutory authority was the UK Home Office), although the UK Government retains certain powers and responsibilities with regards to TV licences. In July 2002, the BBC awarded Capita the contract to manage the TV Licensing system, replacing the Post Office (which had been renamed "Consignia" at this time). In January 2006 the Office of National Statistics classified the licence fee as a tax; previously it had been classified as a service charge. Since April 2014, the BBC World Service on radio and BBC Arabic Television have been funded from the licence fee. Prior to this date they were funded by a grant from the government's Foreign and Commonwealth Office. The World Service cost the BBC £268 million in the 2017/18 financial year. The BBC also paid in 2017/18 contributions to: broadband rollout (£80 million); partial funding of the Welsh channel (£74.8 million), S4C (which is also funded by the Department of Culture, Media and Sport); and a contribution towards the costs of local TV (£4.7 million). BBC World News and the BBC's other international television channels are operated commercially and will continue to not receive licence fee money. The revenues they generate supplement the licence fee in financing the UK services. In addition, the BBC Alba Gaelic language television service is predominantly funded by MG Alba, an organisation funded by the Scottish Government. (*) During 2007/2008, the BBC stated that 3.6% of the licence fee was spent on collection. According to section 363 of the Communications Act 2003, a TV licence must be obtained for any device that is "installed or used" for "receiving a television programme at the same time (or virtually the same time) as it is received by members of the public". According to TV Licensing, "You need a TV Licence to use any television receiving equipment such as a TV set, digital box, DVD or video recorder, PC, laptop or mobile phone to watch or record television programmes as they're being shown on TV". Portable televisions and similar equipment such as laptops and mobile phones powered by internal batteries are covered for use anywhere under a licence held for their owner's residence. On 1 September 2016 the conditions under which a television licence is required changed to include receiving video on demand programme services provided by the BBC, on the iPlayer catch-up service. However, there are a few exceptional cases when live TV may be watched without a licence. watching catch up TV services when the programme is not live except when using the BBC's iPlayer service to receive BBC catch-up programmes. listening to BBC radio programmes over the internet via BBC Sounds. A (free) licence is required for non-exempt premises even when no fee is payable, e.g. premises with residents over 75. A recorded programme watched on unlicensed equipment is outside the scope of the Communications (Television Licensing) Regulations 2004, because it is not "received at the same time (or virtually the same time) as it is received by members of the public," although such recordings may infringe copyright. ensure that when channels on the television are selected no television signal is received. However, TV Licensing also says that it is not compulsory to follow this advice. To listen to digital radio on a TV, for example, it would be necessary to attach the TV to an aerial and tune the TV to different channels. The BBC has made it clear that it is legal to listen to digital radio using a TV without holding a TV licence. According to Ofcom, TV transmissions over the Internet are a grey area which in future might make fees based on television possession redundant. In 2005, a Green Paper by the Department for Culture, Media and Sport included suggestions of "either a compulsory levy on all households or even on ownership of PCs as well as TVs". However, TV Licensing later stated that use of any device (including a computer or mobile phone) receiving transmissions at or about the same time as they appear on TV requires a licence. The BBC is aware that new technology represents a threat to its revenue. A recent BBC report states "there is a continued threat to the growth in TV Licence sales from the increasing number of people consuming television in a way that does not need to be licensed". Televisions receiving a transmission from outside the UK (e.g. broadcast from Germany, Italy, Greece, Turkey and the Netherlands via the Astra satellite, on which many channels are free-to-air) did not need a licence until the Communications Act 2003, which required a TV licence for the reception of television from any source. In 2012, more than 400,000 households informed the BBC that they did not need a TV licence. According to the BBC, the average number of addresses in the UK with a No Licence Needed (NLN) status in the 2013 calendar year was 1,879,877. In June 2013, 5,043 NLN declarations were made to the BBC on the grounds that the address was only watching catch up TV. Can television programmes be recorded? Crown immunity. According to the BBC: "neither the Communications Act 2003 nor the Communications (Television Licensing) Regulations 2004 bind the Crown. Thus, the Crown is not subject to the TV Licensing regime." Prison authorities can assert for Crown immunity to allow prisoners to watch TV in their cells, for example, without a TV licence. Events of national importance. The BBC can grant a dispensation for the temporary use of TV sets away from the licensed address in what it calls 'exceptional circumstances' One example of this was the screening of the Queen's Diamond Jubilee celebrations in 2012. There are well defined criteria for when this exception is valid. A licence is required to watch live TV transmissions anywhere, including residential and business premises. For residential premises, only one licence is required per household per address, regardless of the number of licensed devices or the number of members of the household. However, the licence itself is always held in the name of an individual. A rented property in multiple occupation by a joint tenancy agreement is considered by TV Licensing as one household and requires only one licence, but a rented property with multiple, separate tenancy agreements is not considered a single household and each tenant may require a separate licence. For example, a house in multiple occupation may have private bedrooms and shared communal areas: if five occupants share such a property with individual tenancy agreements then they may require up to five television licences if each private room contains a television receiver, while a similar property housing five occupants under a joint tenancy agreement may require only one television licence. Use of television in a static caravan is covered by the licence held for the user's main address, provided there is no simultaneous use of television at both places, and the use of television in a touring caravan is always covered by the user's main home licence. The use of a television set which is powered solely by its own internal batteries is covered for any address by the user's main home licence, but requires a separate licence if it is plugged into the mains or other external power source, such as a car battery; this also applies to TV-enabled mobile telephones. The TV equipment must not be connected to an aerial or plugged into the mains. A person who watches or records live TV without being in possession of a TV licence is referred to by the BBC as a 'TV licence evader'. Each year the BBC estimates the evasion rate (expressed as a percentage of total 'licensable properties') and publishes the value in its Annual Report and Account. The figure for the number of licences in force is taken from the BBC's database. The other variables used to calculate the evasion rates are estimates. The data for the number of domestic households is taken from the Department of Communities and Local Government figures. The Broadcasters' Audience Research Board survey is used to estimate the rate of penetration of TV sets into domestic households. Non-domestic licences include licences required for students, military accommodation, hotels and businesses. Various sources are used to estimate this figure. The most recent published figures for 2014/15 state that the evasion rate is between 5 and 6%. For the year 2005–6, TV Licensing reported that they "reduced estimated evasion to a record low of 4.7%". However, this figure rose during the following year to 5.1% and remained at 5.1% during 2007–8. For the year 2010/2011 the evasion rate is stated as 5.2%. According to the BBC "the published rate of evasion has increased marginally to 5.5% in 2012/13". The evasion rate is far from uniform across the UK, with Scotland having a far higher rate than the UK as a whole. One reason given by the BBC for evasion is lack of money in a household. For example, in the BBC Full Financial Statement 2012/13 the BBC says: 'as household budgets come under pressure, we are starting to see an increase in licence fee evasion rates over their prior year level'. However, this is not the only reason given for TV licence evasion, since according to a submission made by the BBC to the Information Commissioner's Office: 'the BBC said that it is also aware that a growing number of individuals deliberately evade the licence fee due to dissatisfaction with the BBC'. According to a National Audit Office report from 2002: "Areas with high evasion rates are most likely to have, for example, a higher than average proportion of younger people, low income households, and students and single parent families, and a level of County Court judgments 50 per cent above the national average". However, according to the BBC, 'evasion is spread across all socioeconomic groups'. The BBC has also claimed that the 'TV Licensing evader profile' could be characterised by the distribution by social grade of 1.3m properties that were not licensed on 31 March 2007. The profile was given as follows: AB 20.1%, C1 29.1%, C2 13.6%, D 18.9%, E 18.3%. The Broadcasters' Audience Research Board estimated that of June 2004, 2.3% of UK households do not have television, and in September 2008, the BBC reported that some one million people do not need a TV licence. Alleged excuses given by householders for not having a licence include loss of mail, being "too busy" and suffering from polymorphous light eruption (sun allergy). The results of market research carried out on self-identified evaders concluded that roughly half were 'opportunistic delayers' who were playing the system to avoid immediate payment and that the others were 'deliberate evaders' who were trying to 'cheat the system'. Nearly one fifth of respondents claimed never to have bought a TV licence. Since it is not possible to prevent a person buying and using TV receiving equipment without being in possession of a licence, the TV licence system is enforced by first identifying TV licence evaders and then attempting to sell them a licence and, in some cases, prosecuting them. The critical method of detecting TV licence evaders is through the use of a database system known as LASSY, which contains 29.5 million addresses in the UK. LASSY is an acronym of 'Licence Administration and Support System'. According to the National Audit Office: "The database holds records of potentially licensable properties and basic details (such as the name of the licence holder and the licence expiry date) of those for which valid licences are held". This database is routinely updated with licence holders' details. Until 25 June 2013, dealers in television receiving equipment were required by law to provide TV Licensing with identifying information about everyone who buys or rents such equipment. However this requirement has been lifted by the Enterprise and Regulatory Reform Bill passed in 2013. TV Licensing maintains permanent contact with every address in the database that is recorded as not having a TV licence until a licence is purchased for that address or until TV Licensing confirm that the household does not need a licence. If it is confirmed that a household does not watch or record live TV, the address is put into the NLCC (No Licence Needed Claim Confirmed) category. Residential properties put into this category are not visited or contacted for a period of two years from the time that the claim was confirmed. Business properties on the other hand, are exempted from visits or mailings for three years after confirmation. TV Licensing may make initial contact by letter or by phone with occupants of addresses for which there is no current licence. During the financial year 2012–13, approximately 21.5 million letters were sent to unlicensed addresses. The average postage cost to post one standard TV Licensing letter in the financial year 2012/13 was stated to be £0.2059. The methods by which an occupant can reply are in writing, by telephone or by filling in an online form. If there is no reply to the first letter and a TV licence is not bought by the occupant, then TV Licensing continues to write regularly to the address and "the tone of the letters progressively becomes stronger to encourage a reply". For example, one of its standard letters includes the phrase: "Official warning: We have opened an investigation". This warning was included in 940,615 letters sent in January/February 2013. Another standard letter states: 'Dear Sir/Madam, you have not responded to our previous letters. We want to ensure you have the information you may need before a hearing is set at your local court.' More than 3 million letters containing this phrase were sent in 2011. Three basic tones of voice are used in TV Licensing letters: "Customer Service", "Collections" and "Enforcement". According to the BBC: "Customer service is the brand experience we create for customers who are currently licensed, unknowingly unlicensed or who don’t need a licence", whereas "Collections is the brand experience we create for those customers whose TV licence has expired and whom TV Licensing wants to motivate to renew." Finally, the enforcement tone is used for households who have been unlicensed for a longer period. This period is not specified in freely available documents but TV Licensing suggests it could be used, for example, for the third and fourth renewal reminder. Each of these 'tones' involves letters with a different colour palette. For example, green is used in 'Customer Service' letters and red may be used in 'Collections' and 'Enforcement' letters. In all cases, the vocabulary and format used in the letters is strictly defined. If a business or household is not obliged to have a TV licence then TV Licensing will request written confirmation of this, even though no such information is required to be given in law. According to the BBC, it is not possible to opt out of receiving TVL mailings since they 'are not advertising or marketing material'. Similarly, householders who do not have a licence cannot exclude themselves from unsolicited calls from TV Licensing by registering with the Telephone Preference Service. In 2014, a householder invoiced TV Licensing £40 as a 'processing fee' for 'opening, reading and filing' a TV Licensing letter. Because TV Licensing did not pay the charge, the householder took the claim to the County Court, eventually winning the case and receiving the fee plus other costs incurred. If a colour TV licence is not purchased for an address, TV Licensing agents—known as "visiting officers", "enquiry officers" or "enforcement officers"—make unannounced visits to the address. In August 2013, there were reported to be 334 enquiry officers all employees of the BBC's main enforcement contractor, Capita. Enquiry officers make around four million visits a year to households in the UK and Crown dependencies. Each week an enquiry officer may upload a number of unlicensed addresses onto their "handheld device". The enquiry officer is only allowed to visit the addresses on this list, which are normally within a thirty-minute travelling distance from their home postcode. Enquiry officers do not visit addresses in their own postcode, however. Although TV Licensing enforces the BBC's statutory obligation to ensure that every address where a television licence is required is correctly licensed, its agents have no special right of access and, like any other member of the public, rely on an implied right of access to reach the front door. A householder may withdraw the implied right of access to TV Licensing personnel by contacting the BBC and informing them that this right has been revoked; the BBC says they respect such requests (although could still seek a warrant to search the property), except in Scotland. As of March 2014, 7299 households had withdrawn the implied right of access. This figure had increased to over 20,000 by December 2015. Upon visiting a property, enquiry officers ask a set of predetermined questions to whoever answers the door when they visit." They first try to find out if the person who responds to the enquiry officer is an "appropriate person" to interview (i.e. an adult who lives at the property). They then try to find out if that person has been receiving TV without a licence. If they suspect that this is the case, they issue an official caution to the person that whatever they say may be used against them in court. They then take a prosecution statement and ask the interviewee to sign it. The enquiry officer may ask permission to enter the property and may examine any TV receiving equipment found there. According to the visiting procedures: 'circumstantial evidence of use should be noted on the Record of Interview whenever visible (e.g. sky dish, aerial lead plugged into TV, remote control on settee) as this provides supporting evidence for potential prosecution and may be vital if the confession should later be challenged.'. However, the occupant is well within his/her rights to deny answering any questions (remain silent) and is under no obligation to allow entry into the property. If an agent has evidence that television is being watched or recorded illegally but is denied entry by the occupants so that they cannot verify the suspicion, then TV Licensing may apply to a magistrate for a search warrant. The BBC states that a search warrant would never be applied for solely on the basis of non-cooperation with TV Licensing and that in the event of being denied access to unlicensed property will use detection equipment rather than a search warrant. According to the Daily Mail newspaper: "TV licensing catches all but a tiny minority of cheats by the very low-tech technique of sending inspectors to knock on their doors. Although ‘enforcement officers’ have no official powers of entry, they are trained in either talking their way across the threshold, or tricking homeowners into confessing they have been watching TV illegally." The same newspaper also has reported in 2014 that enquiry officers can double their basic salary of £14,000 (£17,000 in London) by obtaining commission payments. Commission is paid when an enquiry officer obtains a prosecution statement from a householder, although they need to take a minimum of thirty statements in a week before they start earning commission. A Leyland Sherpa television detector van. TV detector vans have in the past featured heavily in TV Licensing publicity, highlighting that technology capable of detecting signals from operating TV sets could be employed. Detector vans date from the 1950s, when the Post Office ran converted Hillman Minx and Morris Oxford estate cars, which had large aerials attached to their roofs. Subsequently Commers were introduced. In the 1980s, vans were supplied by Dodge and Leyland. In the 1990s, Ford Transits were introduced. In 2003, TVL launched its tenth generation of detector vans. It was stated that these vans had removable branding so that they could operate covertly. A Dodge television detector van. Although no technical details of the TV detectors used in these vans have been made public, it is thought that they operate by detecting electromagnetic radiation given off by a TV. The most common suggested method is the detection of a signal from the TV's local oscillator. Hand-held TV detectors have also been developed by the BBC. According to information given to the Daily Mail in 2007, the hand-held detector had a range of 29 ft, giving an audible signal to the operator if a TV was detected. It was also stated that it could be used to detect TVs in 'individual flats in blocks.' In the Birmingham Mail for the same year, the detectors were described as 'little bigger than a torch', weighing 280g, which made a beeping noise when they detect a TV. The company Buckman Hardy Associates has made such equipment for the BBC in the past but the equipment shown in the publicity campaigns run in 2007 was all made by the BBC itself. In 2013 it was revealed that the BBC had used optical TV detectors to apply for a search warrant. Although few technical details were given, it was stated in an application for a search warrant that: "the optical detector in the detector van uses a large lens to collect that light and focus it on to an especially sensitive device, which converts fluctuating light signals into electrical signals, which can be electronically analysed. If a receiver is being used to watch broadcast programmes then a positive reading is returned." The BBC stated that this was strong evidence that a set was "receiving a possible broadcast". Detection appears to be primarily a deterrent to evasion. The BBC admits that no detection evidence has ever been used to prosecute a licence fee evader. They refuse to release any details of the technology supposedly used as to do so would "change the public's perception of the effectiveness of detector vans". A leaked BBC document on the collection and non-collection of the fee summarises findings presented by the TV Licensing's Executive Management Forum and "makes no mention of detector vans – but it does contain plenty of other facts and figures". The BBC states that such technology used in conjunction with targeted advertising acts as a deterrent: its use may make it easier for TV Licensing agents to establish that an offence is likely to be taking place but they would still need to secure further evidence for successful prosecution. Furthermore, such technology is restricted in its use by the meaning of "surveillance and covert human intelligence sources" in the Regulation of Investigatory Powers Act 2000 and the Regulation of Investigatory Powers (British Broadcasting Corporation) Order 2001. Like other public bodies that undertake covert surveillance, the BBC is subject to the scrutiny of the Office of Surveillance Commissioners, which inspects the BBC every other year. A number of official inspection reports on the BBC's detection methods have been made available following freedom of information requests These reports give an outline of the process of authorisation of the use of detection equipment. Briefly, applications for authorisation are made in the name of the Detection Manager of Capita. Correspondence between TV Licensing and the affected householder may be attached to the completed application forms which pass via a quality control 'gatekeeper' to the authorising officers (AOs) at the BBC. In 2012 there were two designated AOs at the BBC. To be authorised, an application must be shown to be 'necessary and proportionate'. AOs sometimes reject applications. Once approved, the authorisation lasts for a duration of eight weeks. TV Licensing states "detection equipment will only be used if other less intrusive and more cost effective routes have been exhausted", and the BBC has stated that "Detection technology is generally used to obtain search warrants". In a reply to a FOI request in 2011, the BBC stated "I can confirm that TVL has not, to date, used detection evidence in Court". The BBC also wrote that such evidence "is unnecessary" because "TVL uses detection evidence when applying for search warrants. If, following service of the warrant an individual is found to be evading payment of the TV Licence, then the evidence obtained via the search warrant is used in court, not the detection evidence. In some cases, TV Licensing may apply to a magistrate (or a sheriff in Scotland) for a search warrant as part of the enforcement process. According to TV Licensing such an application may only be made 'when there is good reason to believe that an offence has been committed, evidence of the commission of that offence is likely to be found, and conditions regarding access to the property warrant the granting of a search warrant'. The same source also states that 'The BBC contracts Capita Business Services Ltd to carry out television licensing enforcement activities, including applying for and executing search warrants.' The BBC's contractor uses powers granted by Section 366 of the Communications Act 2003 to apply for and exercise search warrants. The Act specifies that the search warrant is valid for a month after being granted. According to the BBC, such warrants are usually served in the presence of police officers. The TV Licensing Visiting Procedures state: 'To minimise the impact on normal operations Enforcement Managers accompanied by an EO should in normal circumstances execute search warrants. On no account must the warrant be executed without two officers being present. Normally the two officers must be accompanied by a Police Officer'. The warrant provides an authorisation to search a premises, and to examine and test any television receiver found. However, there is no power to seize any apparatus. According to the BBC Search Warrant Policy "force must not be used by TV Licensing to gain entry to a property". Data on the number of search warrants executed per year in the whole of the UK are not collated or held centrally by the various judicial bodies of the state. However, the BBC, itself, holds the information some of which has become available due to FOI requests. For example, in the financial year 2014/15, TV Licensing applied for 256 warrants to serve in the UK. 167 warrants were granted by the courts of which 115 were executed. In the same year in Scotland no warrants were applied for or served whilst in Northern Ireland 12 warrants were granted and 7 executed in the year. Some idea of the frequency at which warrants are used may also be taken from the result of a recent FOI request. It was revealed that Sheffield Magistrates granted TV Licensing a total of six search warrants in the years 2011, 2012 and 2013, whilst in Northampton (including Wellingborough and Kettering) only two were granted in this period. Information provided by the Scottish Court Service suggests that TV Licensing search warrant applications in Scotland are virtually non-existent. In their response to a FOI request the Scottish Court Service confirmed that no search warrant applications were made to courts in Scotland's two largest cities, Glasgow and Edinburgh, in the three-and-a-half years between 1 January 2011 and 21 July 2014. In 2014, 204,018 people were prosecuted or fined for TV licence offences: 185,580 in England and Wales (173,044 in England and 12,536 in Wales), 4,905 people in Northern Ireland and 15 in the Isle of Man. In Scotland, there were 13,486 cases disposed of via an out of court fine and 32 prosecuted via the courts in 2013-2014. There have been no prosecutions for TV licence offences in Jersey since 2009, all cases having been resolved at Parish Hall Enquiry. Putting these numbers in perspective, it would appear there are more prosecutions and convictions per capita in Wales than in any other country in the UK. Around 70% of TV licence evaders are female. This 30%-70% male/female ratio is pretty much constant across the whole of the UK and is at odds with statistics for other small crimes . :Table B4a This gender imbalance has not always been the case. In 1980, there were roughly similar numbers of men and women proceeded against for TV licence evasion. Since then the proportion of female to male defendants has risen steadily. In 2014, 24,025 prosecutions that were commenced by the BBC did not result in conviction (over one-in-ten cases in England and Wales). Licence evaders are liable for prosecution and a fine of up to £1,000 in the UK. However, because the licensing regime covers six different jurisdictions, the legal processes and penalties for the crime of TV licence evasion differ markedly across the UK and Crown dependencies. The average fine is £170 in England and Wales, £70 in Jersey, £80 in Northern Ireland, £75 in Scotland (out-of-court disposal) and £200 in the Isle of Man. TV licence evasion is not punishable by a period of imprisonment per se, but if convicted evaders refuse to pay the fine they were ordered to pay, or are incapable of paying it, a period of imprisonment may be imposed as a "last resort". The length of stay is decided by the amount owed. In England and Wales, 39 people were given an average of 20 days in 2014 (compared to 32 in 2013 and 51 in 2012). There were no custodial sentences imposed during the five-year period 2009-10 to 2013-14 in Scotland or in Jersey. The British Parliament proposed decriminalising licence evasion, but the proposition was turned down by a House of Lords vote by 178 to 175 in February 2015. Behavioural research conducted for the BBC found that if TV licence evasion was decriminalized and the £1,000 maximum fine was replaced by a civil penalty of over £300, evasion rates would stay at 5%. In England and Wales, prosecutions are the responsibility of the BBC and are carried out by its contractor, Capita, in magistrates' courts In England and Wales TV Licensing has a maximum of 26 weeks to lay information to court after receiving information regarding unlicensed use of a TV from its enquiry officers. During this period, and a maximum of 24 hours before a decision to prosecute a householder is taken, TV Licensing will check if a licence has been purchased. The decision to prosecute usually takes place 12–14 weeks from receiving the enquiry officer's report. TV Licensing serves documents on defendants four to six weeks prior to a court hearing. A final check to see if a TV licence has been purchased is made a maximum of two days before the hearing. Licence fee evasion makes up around one-ninth of all cases prosecuted in magistrates' courts. For every man prosecuted, two women are brought before the magistrates for this offence: it has been speculated that this is because women are more likely to be at home when an enforcement officer calls. Proceedings for TV Licence evasion form a high percentage of all prosecutions carried out against women – over a third of all cases against women in England and Wales in 2013 were for this offence. By comparison, TV licence evasion made up around 5% of prosecutions against men in 2013 in England and Wales. The maximum fine for this offence of up to £1,000 is frequently publicised by TV Licensing to maximise deterrence. In reality, magistrates rarely impose the maximum fines allowed to them by law. For example, during the year 2005–6, the average fine including costs was approximately £153 (slightly more than the cost of a licence). According to a 2013 TV Licensing briefing document, the level of fines and costs imposed by magistrates' courts vary considerably between different regions of England and Wales. In North Wales average fines and costs were stated to be £108.90 whilst offenders in the English Midlands area of "Black Country, Staffordshire & West Mercia" were required to pay £197.70. A guilty plea may also result in a lower fine. According to TV Licensing: "many evaders claim that an enquiry officer told them they would not be prosecuted if they bought a licence". However, it is also pointed out that "it is a disciplinary offence for an enquiry officer to say or suggest this". Nevertheless, the same TV Licensing briefing does say that: "first-time evaders may escape prosecution if they purchase a licence immediately". The UK government has stated that: "Most TV licensing cases that are heard by magistrates courts are uncontested and the case is therefore often resolved in the defendant's absence." The Magistrates' Association has been calling for the decriminalisation of TV licence evasion for nearly twenty years, concerned that evaders are punished disproportionately. The Adam Smith Institute has published a report calling for the BBC to give up the licence fee. One of the reasons given is the licence fee criminalises poor people, in particular women with children living on welfare. The report points out that such people are liable to be re-prosecuted almost immediately unless they dispose of their TVs. In fact, a National Audit Office report from 2002 stated that "significant numbers of offenders do not buy a licence following conviction". TV Licensing is managed as a sales operation and its officers are motivated by commission payments. In 2005, a TV Licensing officer was found guilty of false accounting and perverting the course of justice after he deliberately forged the confessions of four people to obtain commission payments. In April 2012 an Essex man convicted of TV licence evasion had his conviction overturned when TV Licensing were unable to confirm the validity of video evidence they presented in the original trial. According to TV Licensing, 30% of those prosecuted for TV Licence evasion in 2012 were found to have satellite or cable subscriptions. Although those found guilty of TV licence evasion cannot be sent to prison for that offence, if they default on their fine, they can be imprisoned. For example, in 2011, 48 people were imprisoned in England and Wales for defaulting on fines imposed for TV licence evasion. The figure for 2012 was 51. In Northern Ireland, prosecutions are the responsibility of the BBC and are carried out by its contractor, Capita, in magistrates' courts. The prosecution process is very similar to that of England and Wales. In 2008, 5,272 people in Northern Ireland were prosecuted for non-payment of the television licence fee of which 4,118 were fined. The corresponding figures for 2007 were 5,901 people prosecuted and 4,464 fines imposed. Procurator Fiscal's Office in Kilmarnock. In Scotland, the decision to prosecute TV licensing cases is taken by the Crown Office and Procurator Fiscal Office. Very few cases come to court in Scotland. In Scotland, the Crown Office and Procurator Fiscal Office undertakes prosecutions for TV licence evasion. Very few cases in Scotland come to court. Instead of prosecution, in Scotland, TV licence fee evaders are usually asked by the Procurator Fiscal to pay a fiscal fine and a small number are simply given a warning. For example, in 2013-2014, just ten cases reached the courts whereas 12,969 people were asked to pay a fiscal fine, no action was taken in 275 cases, and 174 people were sent a warning. In addition, two people were asked to pay compensation and one person was offered the chance to pay a combination of fiscal fine and compensation. In 2013-14, almost all of the fiscal fines (12,603 out of 12,969) were at the level 2 rate of £75. In 2014-15, 13% of all fiscal fines in Scotland were issued for Communications Act offences, stated to be mainly TV licensing offences. The total number of fiscal fines imposed for these offences was 4,874. In 2015-16, 7,962 fiscal fines were issued for Communications Act offences, of which 72% were issued to women. In 2016-17, there were a total of 4,799 fiscal fines imposed for Communications Act offences. Outcomes of TV licensing charges reported to the Procurator Fiscal. On the Isle of Man, prosecutions are prepared by Capita on behalf of the BBC although they use Manx qualified lawyers in the Magistrates' Court. The maximum fine is £1,000. In a submission to Tynwald (the Isle of Man Government) regarding prosecution for non-payment of the BBC licence fee in the Crown dependencies, the BBC stated 59 cases were laid to court in the Isle of Man between 2007 and 2009 although "these figures include cases where no further action may have been taken (eg because a writ was not served or the case was withdrawn)". In its response to the UK Government's TV Licence Fee Enforcement Review, published in 2015, the Isle of Man Government 'agreed that it is supportive of the decriminalisation of non-payment of the TV licence fee'. The maximum fine for licence fee evasion in Guernsey is £2,000. Initial investigations into licence fee evasion are carried out by Capita employees as in the UK. However, prosecutions are carried out by police and law officers. According to the States of Guernsey: "it appears the TV Licensing Inspectors visit the island once every three to four years, therefore offences are usually reported to us following these visits." In June 2013, Capita's television licensing enforcement officers visited Guernsey where according to the BBC, they found "130 people illegally watching TV without a licence". The Guernsey Police Annual Report 2014 states that no offences of "television receiver without a licence – install/use" were recorded in 2014 as opposed to two such cases in 2013. Number of offences of "television receiver without a licence – install/use"
In 2004, the BBC reported that "Almost 70% of people in the UK want changes to the way the BBC is funded", following an ICM poll for their current affairs programme Panorama, which showed that 31% were in favour of the existing licence fee system, 36% said the BBC should be paid for by a subscription and 31% wanted advertising to pay for the programmes. In August 2008, the Guardian newspaper reported that "The BBC is facing an uphill battle to maintain support for the licence fee", stating that according to an Ipsos MORI poll the newspaper had commissioned, 41% agreed that the licence fee is an "appropriate funding mechanism" and 37% disagreed but when asked whether the licence fee is "good value for money", 47% disagreed, with more than half of them disagreeing strongly. The poll also showed that there is no longer a majority believing that the licence fee assured them of distinctive programming not available elsewhere ― which, the newspaper said, had long been one of the arguments for its existence: 41% of the population disagreed with only 30% agreeing. The poll also showed that opinion was split by a growing north-south and socio-economic divide. In September 2009, the Guardian reported an ICM poll showing an increase in support for the licence fee to 43%; "The fee is backed by 43%, against 24% who think advertising should foot the bill and 30% who think people should pay to subscribe if they want to see BBC programmes. In 2004, only 31% backed the licence fee, 12 points lower than today.". In 2013, according to an ICM poll for the Sunday Telegraph, 70% stated that the BBC licence fee should be abolished or cut. 49% of those polled believed the fee should be scrapped altogether. Previous inquiries, such as the parliamentary Peacock Committee in 1986 and the internal Davies committee in 2000, recommended continuing the licence fee, with conditions. In 2001, an Ofcom report found that the vast majority of those it interviewed, including owners of digital television equipment, supported the principle of a licence fee to fund public service television and radio. The advantages of such funding listed by those interviewed included diversity, high quality, education, innovation, entertainment, information, original productions, pluralism, accessibility, inclusion of minorities and free access. Another reason given in a response to Ofcom by the National Union of Journalists was that the licence fee allows the BBC to "retain independence" from both commercial and political pressures. Nonetheless, having surveyed public opinion during December 2003, a finding of the Department for Culture, Media and Sport was that "the way the licence fee is set and collected raised issues about fairness". Further criticisms, embodied in a 2005 Green Paper, included cost, value for money, whether or not the BBC should be publicly funded, the high cost of collection and enforcement and the methods used. Meanwhile, in 2004, the Institute for Public Policy Research criticised the TV licence fee for its regressive impact, pointing out that it represents a much higher proportion of income for poor households, that evaders are most likely to be single parents, lone tenants, pensioners and the economically inactive and that the difficulties they have in paying the licence fee are compounded by the penalties enforced for non-payment. Other technologies for receiving visual media, such as mobile phones and computers connected to the Internet, has led to questions over whether or not a licence fee based on television receiver ownership can continue to be justified when a television receiver is no longer the sole medium over which the BBC distributes its content; and these technological changes led the Department for Culture, Media and Sport to state in 2005 that the collection of a fixed charge based on television ownership may become difficult to sustain. In 2006, the House of Lords Select Committee on BBC Charter Review criticised the reclassification of the licence fee as a tax, pointing out that the BBC was in consequence reclassified as a central government body, with "significant implications for the BBC's independence". Some critics[who?] claim that the licensing system interferes with the freedom to receive information and contend that this is a contravention of Article 10 of the European Convention on Human Rights (the right to freedom of expression). In a case dealing with the German radio licence, the ECHR in Application No. 26907/95 stated "Such an undertaking cannot be successfully accomplished unless it is grounded in the principle of pluralism, of which the State is the ultimate guarantor." and "The interference complained of was, therefore, necessary in a democratic society. There is, accordingly, no appearance of a violation of the applicant's right under Article 10 (Art. 10)." The television licence fee system has been variously criticised, commented upon and defended by the press. In 2010, the journalist Charles Moore was fined by a magistrates' court for watching TV without a licence. Moore had refused to pay in protest at the BBC's unwillingness to dismiss Jonathan Ross in the wake of his involvement in The Russell Brand Show prank telephone calls. Later, Moore was to describe the BBC licence fee as "the most regressive and most ruthlessly collected of all government imposts.” In 2014, Nick Ross, a BBC presenter, stated that the licence fee was unfair and should be abolished. There are a number of websites that campaign against the TV licence The BBC monitors the internet for references to TV Licensing. According to the BBC "searches are carried out for the purpose of identifying external information relating to TV Licensing such that, where appropriate, we can respond and assist licence fee payers or correct inaccurate information as well as flag up customer complaints." Part of this monitoring 'flags up' critical comments about TV Licensing. An internal briefing note released by the BBC in response to a freedom of information request names the TV Licensing Blog as TV Licensing's "most prevalent activist" who has "built a significant following both for his blog and for his @TVLicensingblog Twitter feed (over 900 followers)". The BBC also monitors YouTube videos of enquiry officers and YouTube videos critical of TV Licensing as well as social media such as Facebook and Twitter. In September 2008, the BBC's governing body, the BBC Trust, launched a review of TV Licensing's methods, following complaints about "heavy-handed" and "intimidating" tactics and during December 2008, it was reported by the press that the chairman of the all-party Commons Culture, Media and Sport committee had accused TV Licensing of behaving "like the Gestapo", employing "tactics that are outrageous", saying: "The tactics used by TV Licensing in their letters are intimidatory and cause genuine distress. Their records are not always correct, but they write letters that assume members of the public are criminals". In 2008, the former BBC television star, Noel Edmonds, stated that he had stopped paying his TV licence in a protest at the tone of BBC adverts aimed at TV licence evaders. The licensing system remains controversial in the Isle of Man due to the fact that the licence fee remains the same as in the UK and Channel Islands, even though the BBC provides neither a local television news service for the Isle of Man (similar to BBC Channel Islands) nor any BBC local radio or national radio opt-out station. The BBC has sought to redress the lack of coverage by improving its online news service for the Isle of Man, with permanent BBC staff based at the Manx Radio studios in Douglas. A Select Committee of Tynwald was established in 2009 to investigate the value for money of the licensing system for the Isle of Man, and the feasibility of the Isle of Man withdrawing from it. The current Royal Charter for the BBC expires on 31 December 2027 and the TV licence fee itself was fixed at £145.50 until March 2017. After this time the fee will increase in line with inflation for five years until 2022; the price was raised to £147. The government stated that "while the current licence fee collection system is in operation, the current system of criminal deterrence and prosecution should be maintained". "television receiver" means any apparatus installed or used for the purpose of receiving (whether by means of wireless telegraphy or otherwise) any television programme service, whether or not it is installed or used for any other purpose. any reference to receiving a television programme service includes a reference to receiving by any means any programme included in that service, where that programme is received at the same time (or virtually the same time) as it is received by members of the public by virtue of its being broadcast or distributed as part of that service. ^ "Businesses and organisations". TV Licensing. Retrieved 14 March 2014. ^ a b c d e "BBC Annual Report and Accounts 2017/18" (PDF). BBC. Retrieved 18 September 2017. ^ a b c d e f g h i "British Broadcasting Corporation Television Licence Fee Trust Statement for the Year Ending 31 March 2013". The Stationery Office. Retrieved 22 April 2015. ^ a b c "Legal framework". TV Licensing. Retrieved 20 October 2014. ^ "The Communications (Television Licensing) Regulations 2004". www.legislation.gov.uk. Retrieved 4 November 2014. ^ "SI 2010/640 The Communications (Television Licensing) (Amendment) Regulations 2010" (PDF). HM Stationery Office. Retrieved 18 January 2013. ^ "Copy of Ask Help script". Whatdotheyknow.com. p. 376. Retrieved 12 February 2015. ^ a b "TV Licence Enforcement Review" (PDF). Department for Media Culture & Sport. Retrieved 16 February 2015. ^ a b c d "SELECT COMMITTEE OF TYNWALD ON THE TELEVISION LICENCE FEE REPORT 2010/11" (PDF). Tynwald, Isle of Man. Retrieved 17 February 2015. ^ "Administering the licence fee". TV Licensing. Retrieved 7 May 2015. ^ "Freedom of Information Act". TV Licensing. Retrieved 7 May 2015. ^ a b c "Further Issues for BBC Charter Review" (PDF). House of Lords Session Report. The Stationery Office Limited. 3 March 2006. Retrieved 15 August 2008. ^ "British House of Commons: Hypothecated taxation" (PDF). ^ a b "About TV Licensing". TV Licensing. Retrieved 23 April 2015. ^ a b c "Who we are". TV Licensing. Retrieved 20 October 2014. ^ a b c d e f "Wording and Approval of TV Licensing Letters". Whatdotheyknow.com. Retrieved 16 January 2014. ^ a b "BBC Review should consider licence fee concessions". Press Release. Institute for Public Policy Research. 27 December 2003. Archived from the original on 29 June 2008. Retrieved 13 August 2008. ^ "The BBC's TV Licensing Service". Capita. Retrieved 2 September 2014. ^ a b c d e f g "Information about TV Licensing induction and training". Whatdotheyknow.com. Retrieved 6 May 2015. ^ a b c d e f "TV Licensing briefing – court training time, costs and information". whatdotheyknow.com. Retrieved 20 February 2014. ^ "Case Law Relating to TV Licensing". Whatdotheyknow.com. Whatdotheyknow. Retrieved 17 September 2015. ^ "About akinika". www.akinika.co.uk. akinika. Retrieved 20 October 2015. ^ "Debt recovery". www.capita.co.uk. Capita Plc. Archived from the original on 15 January 2016. Retrieved 20 October 2015. ^ "New jobs at Darwen TV licence HQ". www.lancashiretelegraph.co.uk. Retrieved 20 January 2014. ^ "TV licensing staff go on strike". BBC. Retrieved 28 August 2014. ^ a b "BBC appoints Proximity to deliver TV Licensing direct marketing". BBC. Retrieved 2 September 2014. ^ "BBC". Fishburn. Retrieved 10 September 2014. ^ TV Licensing. "How long does a TV Licence last?". Retrieved 8 August 2014. ^ a b "British Broadcasting Corporation Television Licence Fee Trust Statement for the Year Ending 31 March 2011" (PDF). www.gov.uk. UK Government. Retrieved 25 August 2015. ^ TV Licensing. "Cancellations and refunds". Retrieved 8 August 2014. ^ a b TV Licensing. "Legislation and policy". Retrieved 8 August 2014. ^ "Licence Fee". BBC Trust. May 2012. Retrieved 29 April 2013. ^ a b "Copy of Ask Help script". Whatdotheyknow.com. p. 429. Retrieved 6 November 2014. ^ "TV licence frozen for six years". 20 October 2010 – via www.bbc.co.uk. ^ a b c TV Licensing. "TV Licensing – All payment methods". Retrieved 31 July 2014. ^ TV Licensing. "PayPoint". Retrieved 3 June 2015. ^ "Over 75 TV Licence". TV Licensing. Retrieved 31 July 2017. ^ "BBC to take on £750m cost of subsidy for over-75s in licence fee deal". The Guardian. Retrieved 26 April 2016. ^ "BBC launches consultation on TV licence fee for over-75s". BBC. Retrieved 27 November 2018. ^ a b "Useful information". TV Licensing. TV Licensing. Retrieved 28 September 2015. ^ "Half price licence for the blind or severely sight impaired". TV Licensing Website Easy Read Guide. Retrieved 20 March 2012. ^ a b "British Broadcasting Corporation Television Licence Fee Trust Statement for the Year Ending 31 March 2015". www.tvlicensing.co.uk. TV Licensing. Retrieved 6 October 2015. ^ "British Broadcasting Corporation Television Licence Fee Trust Statement for the Year Ending 31 March 2014". The Stationery Office. Retrieved 3 October 2014. ^ "Active TV Licenses". www.whatdotheyknow.com. Retrieved 25 April 2015. ^ a b "Evasion rate spreadsheet - a Freedom of Information request to British Broadcasting Corporation". 2012-07-26. Retrieved 2016-09-22. ^ a b "Number of TV licences in the Channel Islands - a Freedom of Information request to British Broadcasting Corporation". 2016-08-23. Retrieved 2016-09-22. ^ "The history of the UK radio licence". www.radiolicence.org.uk. Retrieved 5 August 2014. ^ "Where Next?". BBC Web Site. BBC. Retrieved 5 August 2014. ^ "Where can I find information about the licence fee?". BBC FAQs. 1 April 2019. ^ a b "Legal framework of Licence Fee enforcement activity". www.whatdotheyknow.com. Retrieved 30 December 2014. ^ "Capita Signs BBC contract for TV Licensing Account". BBC. Retrieved 7 April 2015. ^ "How the licence fee was spent in 2009/2010". BBC Web Site. BBC Trust. Retrieved 8 April 2011. ^ a b c d "Trust review of licence fee collection" (PDF). BBC Trust. March 2009. Retrieved 5 May 2015. ^ "Communications Act 2003, Section 363(1)". The National Archives. Retrieved 28 February 2018. ^ a b c "The Communications (Television Licensing) Regulations 2004, Regulation 9". The National Archives. Retrieved 28 February 2018. ^ a b c TV Licensing. "Do I need a TV Licence?". Retrieved 3 August 2008. ^ Oliver, Harriet (1 October 2009). "Firms issued TV licence warning". BBC News. Retrieved 25 May 2010. ^ a b "Official TV Licensing website - BBC iPlayer and the TV Licence". www.tvlicensing.co.uk. ^ a b c "Videos, DVDs and games consoles". TV Licensing. Retrieved 12 July 2011. ^ a b c d "FOI: Administering the TV Licensing system part 1". TV Licensing. Retrieved 11 July 2012. ^ "What if we only have Closed Circuit Television (CCTV) at our premises?". TV Licensing. Retrieved 27 February 2013. ^ a b "TV Licence Requirements: Radio Reception via Television Equipment". Whatdotheyknow.com. Retrieved 20 October 2014. ^ TV Licensing (5 April 2013). "TV Licensing – Technology – devices and online". TV Licensing. Retrieved 5 April 2013. ^ a b c BBC News (13 February 2006). "Fine warning over TV on mobiles". Retrieved 18 June 2006. ^ "Television Licence Checks" (PDF). House of Commons Library. Retrieved 2 September 2013. ^ The Digital TV Group (28 February 2005). "BBC 'to lose in internet TV loophole'". Retrieved 18 June 2006. ^ The Times (5 March 2005). "Computer tax set to replace TV licence fee". London. Retrieved 18 June 2006. ^ "British Broadcasting Corporation Television Licence Fee Trust Statement for the Year Ending 31 March 2012" (PDF). The Stationery Office Limited. 16 July 2012. Retrieved 11 January 2013. ^ Silverman, Rosa (17 June 2013). "More than 400,000 'do not need' TV licence". London: The Telegraph. Retrieved 23 July 2013. ^ a b "Number of 'No Licence Needed' declarations in 2013". Whatdotheyknow.com. Retrieved 24 July 2014. ^ "Exemptions - TV Licence". Whatdotheyknow.com. Retrieved 1 June 2015. ^ "TV Licence in Prisons". Whatdotheyknow.com. Retrieved 3 June 2015. ^ "Copy of Ask Help script". Whatdotheyknow.com. p. 766. Retrieved 1 June 2015. ^ "Copy of Ask Help script". Whatdotheyknow.com. p. 727. Retrieved 1 June 2015. ^ "Q&A: The TV licence and your PC". BBC Web Site. BBC. 15 June 2006. Retrieved 20 July 2008. ^ "Freedom of Information Act 2000 (Section 50) Decision Notice". ICO. 31 March 2009. Retrieved 20 November 2013. ^ "Students". TV Licensing. 27 August 2009. Retrieved 12 July 2011. ^ a b "TV Licensing, "About TV Licensing"" (PDF). Tvlicensing.co.uk. Archived from the original (PDF) on 18 July 2011. Retrieved 12 July 2011. ^ "Students". TV Licensing. Retrieved 3 February 2015. ^ "TV Licensing Annual Review 2014/15". www.tvlicensing.co.uk. TV Licensing. Retrieved 2 October 2015. ^ "TV Licensing Annual Review, 2005/6" (PDF). Tvlicensing.co.uk. Archived from the original (PDF) on 18 July 2011. Retrieved 12 July 2011. ^ a b c d e f g "TV Licensing Annual Review, 2006/7". Tvlicensing.co.uk. Retrieved 12 July 2011. ^ a b c "Review of TV licence fee tactics". BBC News Web Site. BBC. 8 September 2008. Retrieved 8 September 2008. ^ "2010/11 Annual Review" (PDF). www.tvlicensing.co.uk. Archived from the original (PDF) on 22 July 2013. Retrieved 12 July 2012. ^ "Revealed: Britain's capital for TV licence fee evasion is.. Glasgow". Daily Record. Retrieved 7 November 2012. ^ "BBC Full Financial Statements 2012/13" (PDF). BBC. Retrieved 23 July 2014. ^ "Freedom of Information Act 2000 (Section 50) Decision Notice". Information Commissioner's Office. Retrieved 29 July 2013. ^ a b c d "The BBC: Collecting the television licence fee" (PDF). National Audit Office. Retrieved 7 November 2013. ^ "TV licence excuses include postman affairs and sunlight". BBC News. 20 September 2011. Retrieved 20 September 2011. The top ten excuses as defined by TV Licensing were: "Since I had a bit of a fling with the postman I haven't been receiving my mail so I didn't get my TV Licence reminder"; [...] "I never got the reminders because my two-year-old hides all my post in her toy box"; [...] "I'm getting married and am too busy picking flowers, colours and things to buy a TV Licence. "; "I cannot go out to buy a licence because I am allergic to the sun." ^ a b National Audit Office (15 May 2002). "The BBC: Collecting the television licence fee". Retrieved 18 June 2006. ^ "Official TV Licensing website - TV dealers". www.tvlicensing.co.uk. ^ "Enterprise and Regulatory Reform Bill" (PDF). UK Parliament. Retrieved 4 July 2013. ^ "Letters sent out". Whatdotheyknow.com. Retrieved 18 November 2014. ^ "The BBC's use of the term "Investigation"". Whatdotheyknow.com. Retrieved 16 January 2014. ^ "TV Licensing Written Correspondence". Whatdotheyknow.com. Retrieved 8 September 2014. ^ "TVL: Frequency of use of misleading court threats". Whatdotheyknow.com. Retrieved 8 September 2014. ^ "Copy of Ask Help script". Whatdotheyknow.com. p. 246. Retrieved 8 April 2015. ^ "Copy of Ask Help script". Whatdotheyknow.com. p. 320. Retrieved 10 April 2015. ^ "TV Licensing successfully sued". Whatdotheyknow.com. Retrieved 16 April 2015. ^ "Do TV Detector Vans Exist?". Radio Times. Retrieved 31 October 2013. ^ a b Glenni, Alasdair (24 March 2014). "7,000 homes block visits from the TV licence enforcers: Growing numbers taking advantage of legal loophole that means they can threaten to sue collectors for trespass". Daily Mail. Associated Newspapers Limited. Retrieved 18 August 2015. ^ "Policy Change for Scottish Residents regarding access withdrawal". WhatDoTheyKnow. WhatDoTheyKnow. Retrieved 18 August 2015. ^ "Implied Right - a Freedom of Information request to British Broadcasting Corporation". WhatDoTheyKnow. 2015-12-27. Retrieved 2016-12-12. ^ Adams, Guy (5 October 2013). "Are TV detector vans just a cunning con trick?". London: Daily Mail. Retrieved 17 March 2014. ^ Sinmaz, Emine (13 September 2014). "£1,000 bonuses for staff who hound BBC licence fee dodgers". London: Daily Mail. Retrieved 17 March 2015. ^ "TV Licence – Columbo". The National Archives. Retrieved 27 September 2012. ^ a b "Press Office – New generation of television detector vans". BBC. Retrieved 12 July 2011. ^ "Are TV detector vans just a cunning con trick?". Daily Mail. Retrieved 20 May 2014. ^ "New generation of television detector vans hit the streets". BBC. Retrieved 3 June 2014. ^ "How do the detector vans work?". TV Licensing. Retrieved 21 October 2013. ^ "Deceptor vans". New Scientist. Retrieved 19 May 2014. ^ Gallagher, Ian (14 July 2007). "The new TV detector which can reach into any home". Mail Online. Associated Newspapers Ltd. Retrieved 7 July 2015. ^ "New weapon to catch TV licence cheats". www.birminghammail.co.uk. 1 August 2007. Retrieved 9 January 2015. ^ Buckman Hardy Associates. "EXAMPLES OF PREVIOUS PROJECTS". Archived from the original on 3 February 2008. Retrieved 18 June 2006. ^ "Hand-held TV detectors". Whatdotheyknow. WhatDoTheyKnow. Retrieved 7 July 2015. ^ a b "Statements involving TV Detector evidence". Whatdotheyknow.com. Retrieved 18 December 2013. ^ "Are TV detector vans just a cunning con trick? For decades it's been claimed they trap licence cheats. In fact, they've never led to a single prosecution". ^ "Do TV detector vans exist? Leaked document suggests they could be a ruse". ^ "Home Office – The Regulation of Investigatory Powers (British Broadcasting Corporation) Order 2001". Opsi.gov.uk. 4 July 2011. Retrieved 12 July 2011. ^ "Annual Report of the Chief Surveillance Commissioner" (PDF). The Stationery Office. Retrieved 30 September 2013. ^ "Office of the Surveillance Commissioner's Report, 2008". Whatdotheyknow.com. Retrieved 12 January 2014. ^ "Our roles and responsibilities". TV Licensing. Retrieved 30 October 2014. ^ "Evidence from TV Detection Equipment". ^ a b c "FOI: Administering the TV Licensing system part 2". Tvlicensing.co.uk. Retrieved 14 August 2012. ^ "Communications Act 2003". www.legislation.gov.uk. Retrieved 13 February 2014. ^ "Request for documents and clarification of Visiting Procedures". Whatdotheyknow.com. Retrieved 28 March 2014. ^ "TV licensing Search warrant information". Whatdotheyknow.com. Retrieved 12 August 2014. ^ a b "Monthly Performance Pack". www.whatdotheyknow.com. WhatDoTheyKnow. Retrieved 13 July 2016. ^ "Instances of evidence submitted for TVL to obtain search warrants". Whatdotheyknow.com. Retrieved 24 February 2014. ^ "TV Licensing Search Warrant Applications - a Freedom of Information request to Scottish Courts and Tribunals Service" (PDF). 21 July 2014. ^ Nowell, Andrew (31 July 2015). "TV licence fines branded unfair". Wigan Today. Retrieved 9 September 2015. ^ a b c "No-one jailed in Scotland for failing to pay TV licence compared to scores in England". Herald Scotland. 9 August 2015. Retrieved 9 September 2015. ^ "1,500 Derbyshire people sign petition to scrap TV licence fee". Derby Telegraph. 27 May 2015. Archived from the original on 27 August 2015. Retrieved 9 September 2015. ^ "Criminal Court Statistics Quarterly, England and Wales July to September 2014" (PDF). www.gov.uk. Ministry of Justice. Retrieved 11 September 2015. ^ Gordon, David (1994). "Television, crime and poverty". Radical Statistics. 57: 3–8. Retrieved 10 November 2015. ^ "Almost 23,000 escape TV licence fines". ^ "TV Licence". www.gov.uk. Retrieved 20 February 2014. ^ Rushton, Katherine (18 August 2015). "English fined TWICE as much as Scots over TV licences". Daily Mail. Retrieved 9 September 2015. ^ "House of Lords blocks attempt to decriminalise licence fee non-payment". rts.org.uk. Royal Television Society. Retrieved 9 September 2015. ^ a b "TV Licence Fee Enforcement Review" (PDF). www.gov.uk. Department for Media Culture & Sport. Retrieved 9 September 2015. ^ a b "TV Licensing Prosecution Time Limits". whatdotheyknow.com. Retrieved 18 March 2015. ^ Glennie, Alasdair (14 August 2014). "How BBC sends out 100,000 'bullying' licence letters threatening viewers with jail every day". London: The Daily Mail. Retrieved 14 August 2013. ^ "Thousands of TV Licence cheats face prosecution every week". This is Money.co.uk. Retrieved 11 October 2012. ^ a b "Numbers of prosecutions for TV licensing issues". whatdotheyknow.com. Retrieved 29 July 2014. ^ "TV Licence Fee: briefing". BBC. Retrieved 20 February 2014. ^ a b "Magistrates' Court Sentencing Guidelines" (PDF). Sentencing Guidelines Council. Archived from the original (PDF) on 4 March 2014. Retrieved 4 March 2014. ^ "Daily Hansard – Written Answers". UK Parliament. Retrieved 7 April 2014. ^ "Thousands in court every week for not having a TV licence". London: www.telegraph.co.uk. 20 March 2012. Retrieved 22 March 2013. ^ "GLOBAL PLAYER OR SUBSIDY JUNKIE? DECISION TIME FOR THE BBC" (PDF). Adam Smith Institute. Retrieved 8 July 2013. ^ "Managing TV licensing for the BBC". Capita. Archived from the original on 11 March 2012. Retrieved 28 January 2012. ^ "Job Advertisement". Capita. Retrieved 28 January 2012. ^ WalesOnline (24 September 2005). "TV licence worker guilty of pay scam". ^ "Man wins TV licence battle". Thurrock Gazette. Retrieved 18 August 2012. ^ "FOI releases for October 2013". UK Government. Retrieved 12 August 2014. ^ "Criminal justice statistics quarterly: December 2013 - Outcomes by offence spreadsheet". www.gov.uk. UK Government. Retrieved 1 October 2015. ^ "Magistrates' Courts Rules Committee Costs in criminal cases (magistrates' courts)" (PDF). Northern Ireland Courts and Tribunals Service. Retrieved 22 July 2014. ^ "Parliamentary Business". www.parliament.uk. UK Government. Retrieved 11 August 2015. ^ "Involved in a case". Crown Office and Procurator Fiscal Office. Retrieved 21 July 2014. ^ a b c "TV Licence – Fiscal Fines". COPFS. Retrieved 21 October 2014. ^ "CRIMINAL PROCEEDINGS IN SCOTLAND 2014-15". www.gov.scot. Scottish Government. Retrieved 28 March 2019. ^ "CRIMINAL PROCEEDINGS IN SCOTLAND 2015-16". www.gov.scot. Scottish Government. Retrieved 28 March 2019. ^ "CRIMINAL PROCEEDINGS IN SCOTLAND 2016-17". www.gov.scot. Scottish Government. Retrieved 28 March 2019. ^ "Copy of Ask Help script". Whatdotheyknow.com. p. 994. Retrieved 30 October 2014. ^ "Isle of Man Constabulary". Isle of Man Government. Retrieved 28 September 2016. ^ "Isle of Man Government Response to Consultation on TV Licence Enforcement" (PDF). www.gov.uk. UK government. Retrieved 18 September 2015. ^ a b "Administering the licence fee". TV Licensing. Retrieved 3 February 2015. ^ "Request regarding TV licence evasion". gov.ge. States of Guernsey. Retrieved 16 April 2018. ^ "Guernsey residents face TV licence fines". bbc.co.uk. BBC. Retrieved 28 July 2015. ^ "Bailiwick of Guernsey Law Enforcement Annual Report for 2014". Guernsey Police. Retrieved 9 July 2015. ^ "Publications". Guernsey Police. Retrieved 28 July 2015. ^ "Television licence offence prosecutions and convictions (FOI)". gov.je. States of Jersey. Retrieved 16 April 2018. ^ "Freedom of Information" (PDF). www.jersey.police.uk/. States of Jersey Police. Retrieved 27 September 2016. ^ "Television licensing prosecutions (FOI)". gov.je. States of Jersey. Retrieved 16 April 2018. ^ "Majority 'want change to TV fee'". BBC News. BBC. 6 March 2004. Retrieved 14 August 2008. ^ Owen Gibson (18 August 2008). "Broadcasting: Survey blow to BBC as public question case for licence fee". London: The Guardian. Retrieved 18 August 2008. ^ Glover, Julian (4 September 2009). "Public rejects Murdoch view of BBC, says ICM poll". The Guardian. London. Retrieved 20 December 2010. ^ Ross, Tim (2 November 2013). "BBC licence fee should be cut or scrapped, poll finds" – via www.telegraph.co.uk. ^ "Public Service Broadcasting: What Viewers Want" (PDF). ITC Research Publication. Independent Television Commission. January 2001. Retrieved 13 August 2008. ^ "Ofcom Review of Public Service Broadcasting: Response by National Union of Journalists". Creators' Rights Alliance web site. Creators' Rights Alliance. Retrieved 13 August 2008. ^ "What you said about the BBC". Review of the BBC's Royal Charter. Department for Culture, Media and Sport. July 2004. Archived from the original on 26 October 2008. Retrieved 12 August 2008. ^ "Reforming the BBC". The Economist. 3 March 2005. Retrieved 16 August 2008. ^ "Future of the BBC". UK Parliament. 21 October 2013. Retrieved 17 December 2013. ^ Jonathan Miller (12 January 2003). "Mean fields: Naked into the TV courtroom". Sunday Times. London: Times Newspapers Ltd. Retrieved 15 September 2008. ^ LTD., KETSE. "KRETZSCHMAR v. GERMANY". echr.ketse.com. ^ David Cox (26 August 2002). "Kill the licence fee". New Statesman. Retrieved 14 August 2008. ^ Roy Greenslade (28 July 2003). "So who really hates the BBC?". London: The Guardian. Retrieved 18 August 2007. ^ Polly Toynbee (19 September 2003). "BBC needs a Bullywatch". London: The Guardian. Retrieved 18 August 2007. ^ "Nick Ross: Scrap BBC licence fee". 25 March 2014 – via www.bbc.co.uk. ^ a b "BBC Monitoring of Third-Party Websites". Whatdotheyknow.com. Retrieved 4 February 2014. ^ a b "YouTube material takedown requests". Whatdotheyknow.com. Retrieved 4 February 2014. ^ "Monitoring of active resistance to the Licence Fee". Whatdotheyknow.com. Retrieved 11 August 2014. ^ Alex Singleton (14 December 2008). "BBC sacks contractor over licence fee warning letters containing false statistics". Daily Telegraph. London: Telegraph Media Group Limited. Retrieved 18 December 2008. ^ "Noel Edmonds: 'I won't pay TV licence because of 'threatening' BBC adverts". London Evening Standard. Retrieved 18 April 2013. ^ "BBC Charter and Framework Agreement". GOV.UK. Retrieved 16 January 2016. ^ "BBC Funding Settlement" (PDF). UK Government. Retrieved 24 June 2013. ^ "BBC licence fee to rise 'in line with inflation'". ITV News. Retrieved 2017-01-16. ^ "Television licence fee increases to £147 in first rise since 2010". The Guardian. Retrieved 16 May 2017. ^ "TV licence fee to rise to £147 in April, government announces". BBC News. Retrieved 17 May 2017. ^ "BBC Charter Review 2016 Information Sheet - Funding" (PDF). GOV.UK. UK Government. Retrieved 16 January 2017. Wikimedia Commons has media related to Television licensing in the United Kingdom.